Tag-based policies enable you to control access to resources across multiple Hadoop components without creating separate services and policies in each component. You can also use Ranger TagSync to synchronize the Ranger tag store with an external metadata service such as Apache Atlas. TAG Enter the applicable tag name. The public group contains all users, so setting a condition for the public group applies to all users. Click Add Conditions to add or edit policy conditions. "Accessed after expiry_date (yes/no)? ": To set this condition, type yes in the text box, then select the green check mark button to add the condition. Enter boolean expression: Available for allow or deny conditions on tag-based policies. For examples and details, see “Using Tag Attributes and Values in Ranger Tag-Based Policy Conditions”. Component Permissions Click Add Permissions to add or edit component conditions. To add component permissions, enter the component name in the text box, then use the check boxes to specify component permissions. 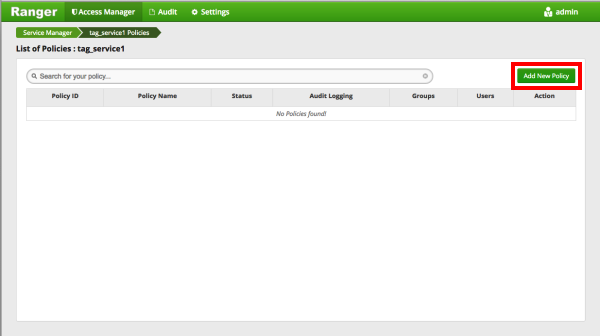 Select the green check mark button to add the chosen component conditions to the policy. Currently there is no Atlas hook for HBase, HDFS, or Kafka. For these components, you must “Manually Creating Entities in Atlas”. 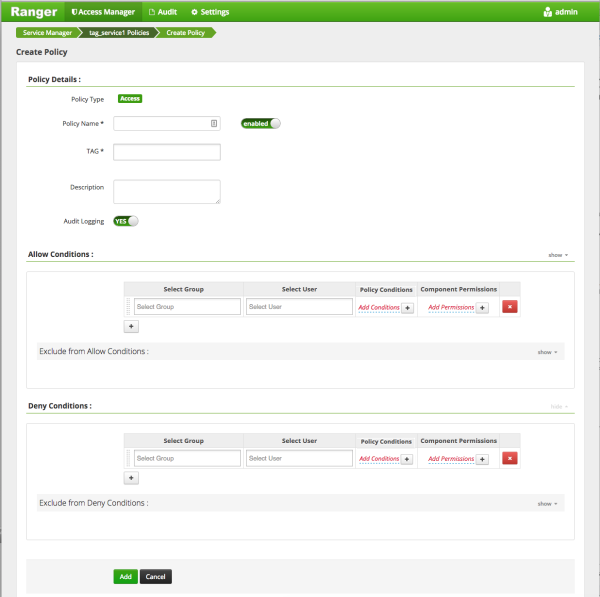 You can then associate tags with these entities and control access using Ranger tag-based policies. You can use the Plus (+) symbols to add additional conditions. Conditions are evaluated in the order listed in the policy. The condition at the top of the list is applied first, then the second, then the third, and so on. Enter boolean expression allows Ranger to use tag attributes and values when configuring tag-based policy Allow or Deny conditions. It allows admins to provide boolean expression(s) using tag attributes. 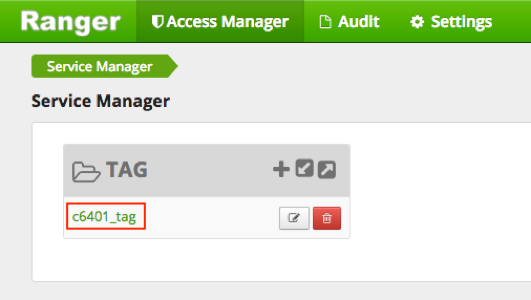 An EXPIRES_ON tag-based policy is created automatically when a tag service instance created. This default policy denies access to objects tagged with EXPIRES_ON after the expiry date specified in the Atlas tag attribute. You can use the following steps to review the default EXPIRES_ON policy.